To begin at the superficial and working up from there, Tom Hamilton has, in the best, traditional sense, the ear of an acoustic instrumentalist and composer, despite his creative participation on the electronic side of events. This is, for me, first among those qualities immediately apparent, particularly if the listener has had considerable exposure to other electro-acoustic endeavors. Another Hamilton characteristic, shared in the disc here reviewed by his collaborator, trombonist Peter Zummo, is a reluctance to wax raucous. When they do become loud, they do so for contrast’s sake. I attribute this sotto voce mindset to a question of shared taste, obviously, but also to a confidence on both players’ parts in the musical worth of what they’re about. Bombast is a stranger here. Not, to repeat, that we lack fortes. They appear as an aspect of the climate — sunny in the morning giving way to clouds in the afternoon — rather than a relentless wind. In order to make sense of this most unusual music, allow me to mention a rule of thumb that’s held up well: a divide separates audiophiles from music lovers. Bridges are few. Yes, a number of serious music lovers are stone-devoted sound-freaks, yet in this community, whether we care to admit it or not, they’re in the minority. For the unalloyed audiophile, the sound is the thing. If the subject be cables, discourse or demo, he’ll sit transfixed, as if under an enchantment. Tubes? Don’t ask. But a music maven, not, nor does he really desires to become one. Thus a small library of vapid fare produced in such a fashion as to meet an audiophile standard: logs, as it were, for his hardware’s andirons. Our conspicuous consumer would likely find Slybersonic Tromosome puzzling for the three minutes or so he spent in the sweet spot trying to make it out. Has he gone? Excellent! Now that we’re no longer in mixed company, I can speak without fear of incomprehension of this splendid duo’s wit and whimsy as it occurs in an improvisational climate which one perceives in delightful contradiction as anything but. What the attentive listener does notice, and quickly, is an affinity, seemingly meticulously mapped, borne of sympathetic temperaments at large within a context of experience. Hamilton and Zummo have been collaborating in this fashion for a long a time, yet there’s a quite remarkable freshness to their interactions. This along with a sense of carefully cultivated yet feather-light, airy maturity are, for me, the disc’s salient charms, and I don’t use the word frivolously. These are precisely the qualities informing one of my favorite CDs, Off-Hour Wait State, Some Music about the Subway, oo discs 0026, Hamilton’s impressions of various New York City stations, above and below ground, in which Peter Zummo participates with four other musicians in addition to Hamilton. Titles tell a good bit of the story. There is, of course, the slyly subversive Slybersonic Tromosome, which sound to me a little like sort of gene damage one might undergo from time too long spent in space. Within we find numbers such as Neural Sturgeon, Raging Ions, Rachel Tension, Today’s Beat Thing Tomorrow, and so on. Insouciance would appear the order of the day, and is, after its easy-going fashion. Let’s recall that duos and other combinations of acoustic with electronic sounds have a long and varied history, from Mario Davidovsky’s steadfastly uptown Synchronisms to, as an exemplar of the downtown sensibility applied with finesse, Slybersonic Tromosome, which stands in this listener’s estimation on a very high pedestal. 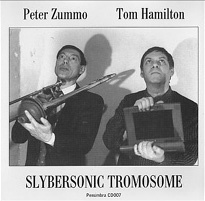 SLYBERSONIC TROMOSOME. Tom Hamilton, synthesizer, electronics, beat thing; Peter Zummo, trombone, valve trombone, irrigation hose, didjeridu, mouthpiece extender, beat thing, superfunnel. PENUMBRA CD 007. Tom Hamilton has been a member of composer Robert Ashley’s touring opera ensemble since 1990, including festival performances in the US, Europe and Japan, performing the sound processing and electronic orchestration, along with his rôle as mixing engineer in recordings of Ashley’s operas. As producer and engineer, Hamilton has worked in over thirty recordings of New-York based artists, including Alvin Lucier, David Behrman, Thomas Buckner, Jonathan Hart Makwaia, Phill Niblock, Joseph Kubera and “Blue” Gene Tyranny. Hal Rammel’s label statement: I began Penumbra Music in 1994 as a means to produce and distribute recordings of my own work as a soloist and ensemble partner. Thus the label has grown in the direction of my own interests in musical experimentation, sound exploration, and free improvisation. With some experience and, I hope, realistic expectations regarding the commercial distribution of such music, I have begun to expand the label beyond the scope of my own personal projects to include artists whose interests follow similar paths, e.g. sound art, instrument invention, improvisation.